Living with a disability can be challenging and living with an invisible disability can be even more challenging, especially for a young girl. When she experiences strange things happening in her body, getting people to understand what she is going through can be frustrating. That’s what Laura went through as she began to realize that she might have a disability. Laura experienced periods of extreme illness and would fall unconscious several times a day. She stayed at home alone and in bed scared to go to school or even walk around her home. What if she went to school and passed out on the way to class? Her family and boyfriend became her caretakers, her doctors couldn’t figure out what was going on, and many people simply didn’t believe her. Was she crying wolf? Laura began experiencing stomach pains and illness in her junior year of high school. She started losing consciousness more frequently and had very little energy. Despite her health issues, she continued to pursue her passion for acting and even played two lead roles in her senior year. Her plan was to go to college to study Broadcast Journalism and Theater, but, she quickly realized that her body was not up for the adventure. While Laura was an excellent student, her health issues and hospital stays got in the way of the college experience. She missed classes and lost friends each time her health declined. Her doctors were stumped. They couldn’t figure out what was causing her stomach pain or loss of consciousness. Some thought the problem might be psychological as if she were only crying out for attention. A few people were on Laura’s side. Her family, boyfriend, primary care physician, and soon, a cardiologist all worked to keep her safe and search for answers. Laura’s physician suspected she had a heart condition called Neurocardiogenic Syncope, the symptoms of which include a rapid drop in blood pressure leading to a loss of consciousness. “It got to the point where I was passing out up to 40 times a day. My mom bought me a helmet, padded the hallway from my room to the bathroom, would leave me food on the tray table in my room and told me I could only leave my bed to use the bathroom. She had to go to work.” The cardiologist prescribed medication which was helping, but Laura continued to have bad days. One day in particular was nearly fatal. It was only after Laura fell from a three-story balcony during an episode of syncope, that doctors began to take her seriously. 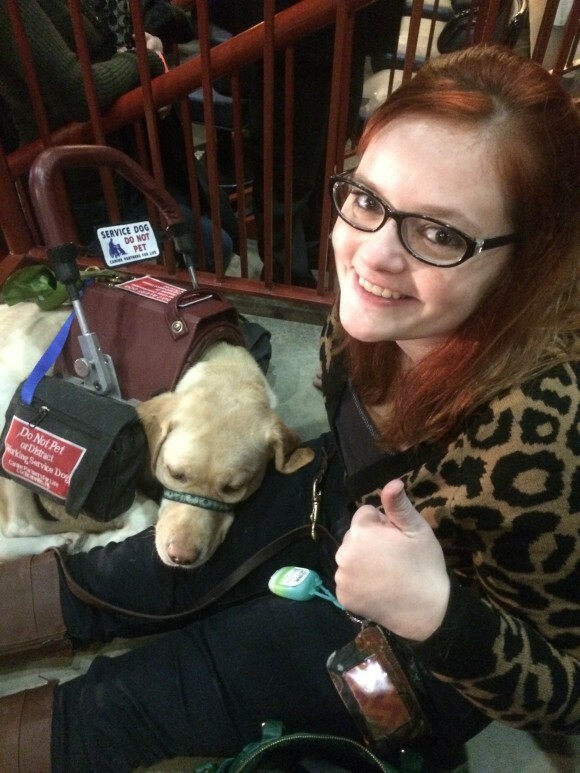 It was at a Dysautonomia Conference in Washington, DC that she learned about service dogs and what one could do to improve her lifestyle. Once again, doctors were skeptical, but Laura and her mom started researching service dog organizations that could help. Canine Partners for Life is one of the very few organizations that train dogs for cardiac alert. 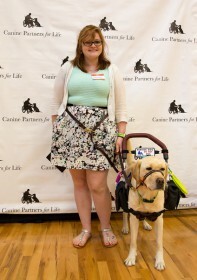 In the summer of 2015, Laura was partnered with a yellow Labrador named Zeva. While Laura felt a bit overwhelmed when she arrived for CPL’s Team Training, she found kindred spirits among the other students in her class. She met Marty, another woman living with syncope who was partnered with her successor dog, Hector. The two of them put their faith in CPL and trusted their new canine partners with their hearts for the next three weeks of training. Laura and Zeva bonded quickly. Though she was slow to pick up Zeva’s alerts initially, Laura’s classmates helped her recognize them. A self-proclaimed perfectionist, Laura worked hard to master skills and training throughout the three weeks, even during down-time following an alert. At her graduation ceremony, Laura couldn’t contain her excitement for all that lay before her. She planned to pursue her passion for theater and music by performing on stage again and attending lots of concerts. Since graduating with Zeva, Laura has not lost consciousness for 17 months. She is more independent and is back to performing musical theater including roles in Seussical the Musical, Godspell, and Into the Woods. Zeva has even made a few appearances on stage. Marty and Laura continue to stay in touch. Marty even attended one of Laura’s performances.